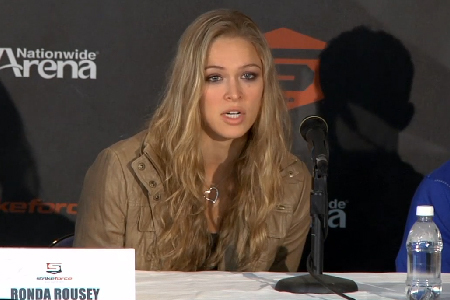 “Strikeforce: Tate vs. Rousey” takes place Saturday inside Nationwide Arena in Columbus, Ohio. The first preliminary bout is scheduled to start at 8PM ET/5PM PT. Make sure to stay with 5thRound.com all night for our live coverage. Showtime Extreme kicks off the festivities by broadcasting four preliminary fights at 8PM ET/PT. Showtime will then air the card’s main bouts at 10PM ET/PT. Saturday’s card will feature a women’s bantamweight title scrap between champ Miesha Tate and Ronda Rousey (Pictured). Lightweights K.J. Noons and Josh Thomson will serve as the co-main event.